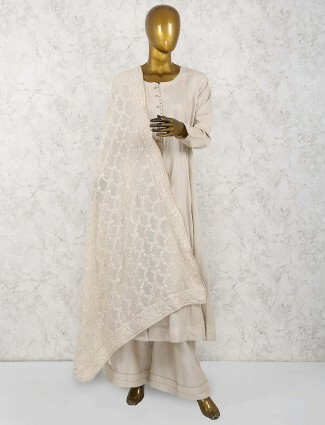 Palazzo Suits Collection at G3fashion.com are not only the classic formal styles but also have designs for wedding and Indian festivals that have the Indian fashion styles. Palazzo suits are one of the old trends which have now picked up a high fashion statement look with all age women especially mid age women to wear them as casual wear or a party wear when styled and combined with stylish kameez styles. Shop palazzo suits with G3fashion.com for best style options to get all size options and some in unstitched dresses to stitched palazzo suit styles. 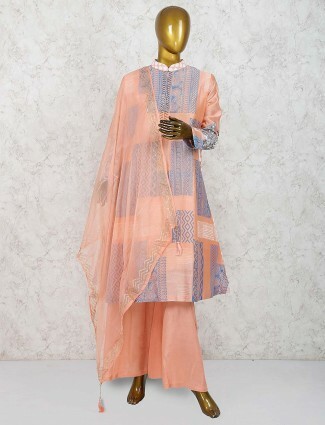 At G3+fashion buy designer palazzo suits online in stylish kurta tunic kameez styles and palazzo pants, get stylish malmal palazzo suit, cotton silk designer palazzo suit, embroidered palazzo suits, sharara styled palazzo suits and cropped palazzo salwar suits. Choose from a number of colors for your designer look from pastel palazzo suits, light colors and tints to dark and bright work palazzo suits. New designer styles in palzzo suits are the dark and earthy tones of digital printed kameez in silk cotton silk, crepe silks and paired with plain solid palazzo pants. The centre opening kameez styles with tie up belts or the angrakha style kameez top with palazzo are the new stylish looks of party wear salwar suits with palazzo pants. Also go for styles in statement embroidered or embellishments on one shoulder placement or waistline or backline loo on kameez. Or go for pleated waistline kameez pattern or the a-line kameez with palazzo pants for party wear look. We have them all in affordable prices or heavy designer styles for wedding wear or festive and party wear occasions. 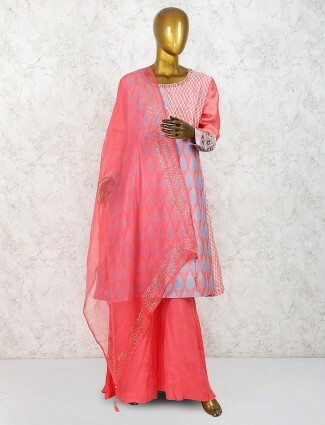 The most demanded styles are in straight cut salwar suits with palazzo pants, they come in a kameez with cuts on sides and is a straight cut pattern in solids or prints and may have little embroidery detail on neck, waist, yoke or sleeves. Paired with palazzo trousers in plain fabrics, in gotta work or crushed fabrics of cotton or silks. They look absolutely wonderful and adds more definition to the whole designer look of the palazzo suits. Styles of Palazzo suits online on our website has options of sleeve patterns from long, with bell or normal styles, short sleeves or sleeveless styles. Choose neck patterns of stand collar, round neck, boat neck and v-neck are most trending neck pattern in palazzo suits salwar suits styles to shop for. Palazzo suits shopping in budget range can be found in best quality and sober yet elegant look at g3fashion.com. Shopping for Double layered styles or jacket style styles in palazzo suits is also available on our website. Which evert style in palazzo suits is required from palazzo style to kameez styles or in colors, fabric choices like satin, crepe, cotton silk, tussar silk, net, silk brocades, velvet can all be shopped for online with our palazzo suits collection online. We all love the simple palazzo suits in georgette, cottons or linen for daily wear to casual wear look. Get your perfect casual style palazzo suit in printed styles of palazzo and plain kameez or a plain palazzo with printed kameez with dupattas in very affordable range. Go for bright colors of palazzo suits in silks and chanderi silk, cotton silk to tussar silk jacket style salwar suits for wedding occasions. We offer best services of palazzo suits online shopping with G3+, where we provide Live shopping on video call for customers to get maximum satisfaction of seeing product live before they can purchase the same. Therefore building very high trust to shop risk-free with G3fashion and G3+ Video shopping services. Wedding wear trends or festival trends of palazzo suits have been inspired from celebrity fashion of designer wear. We recently see actresses like Esha Gupta, Sonam Kapoor, Madhuri Dixit dress in palazzo suits in net lucknowi fabrics, khadi or linen in beige and frill palazzo pants with short knee high kameez. Go for maxi dress style tunic kameez with crushed cotton palazzo pants. A stylish layered kameez with high low hemline and net transparency effect with a buttoned down look with palazzo trousers. Go for high neck or cold shoulder patterns in palazzo suits for party wear looks and also style long anarkali kameez in work concepts with palazzo suits for a wedding occasions. 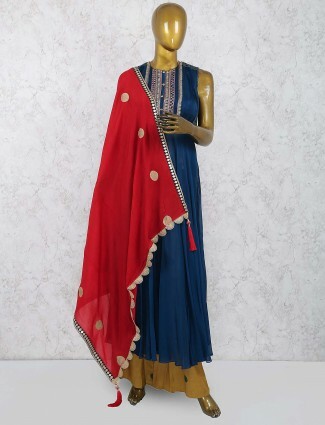 Next time you are looking to buy palazzo suits online, G3fashion.com is one stop online store to find all trendiest styles of palazzo style salwar suits for every one for casual day, party wear, wedding wear, festival wear and for any other purpose.